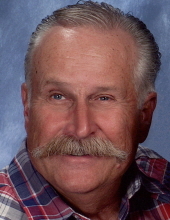 John "Jack” Gruna, 75, died on Friday morning, March 29, 2019 after a 2 1/2 year struggle with several cancers. Jack was born in Los Angeles and grew up in Woodland Hills, CA when it was a rural community. He loved working with his hands and keeping his model T going. He first met his sweetheart in kindergarten when she stole his truck out of the sandbox. In High School, his mother made him vests to match Suzanne's dresses for the proms. After High School, he joined the Marines and was stationed on the carrier Oriskany, from which he enjoyed many adventures in the Far East. After his tour of duty, he joined the California Highway Patrol where he helped many people. Jack married Suzanne Kowalewsky in 1965 and they had two children and lived mostly in Calaveras County. There they homesteaded a rural farm, from which he started his own commercial welding business, Certified Welding Company in 1985. Jack was always very fond of animals, especially his dogs, but could be seen whistling to the birds and talking to the rabbits that would come to the sliding glass door to visit him. His love for Montana grew during summer vacations, so in 2005 he moved with his family to Lewistown. One of his goals was to make someone laugh and smile every day so he would often regale those he met with his stories and jokes. This attitude was very much appreciated during his hospital stays where caretakers often felt like friends. Jack was preceded in death by his parents. He is survived by his wife, of almost 55 years; son, Joseph (Ching) of New Jersey; daughter, Sharon (Jonathan) of Helena; and 6 grandchildren, Christine, Robert John, Katelyn, Gianna, Kyra, and Zoey. Funeral services will be at St. Leo's Catholic Church on Saturday, April 6, 2019 with viewing/visitation at 10:00 a.m. and Mass at 11:00 a.m. Cremation will follow and Jack will be interred in St Andrews Cemetery near his parents. In lieu of flowers, donations can be made to Central Montana Hospice or charity of your choice. To send flowers or a remembrance gift to the family of John "Jack" Gruna, please visit our Tribute Store. "Email Address" would like to share the life celebration of John "Jack" Gruna. Click on the "link" to go to share a favorite memory or leave a condolence message for the family.